It's not in your head. It was always six years in the marketing leading up to the book's release. I'm as confused as you!!! I think Pablo or the advertisement made an error (Pablo in this case IMO, because I've seen it said everywhere else that Bloodline is 6 years before TFA). He's made mistakes before, forgotten things, misread Tweets, etc. He's only human, and I certainly don't take it as a sign that the timeline changed. Such a random change that impacts nothing would be pretty odd. Pablo has a ton of SW information stored in his head at all times. He's bound to make mistakes. It's nothing new. @frolickingfizzgig Right, I doubt there's anything intentionally misleading going on here, just something I noticed. It's been months since I read it, so can't remember if it's clear from the story how much time passes in Bloodline. If it's about a year, that would make more sense, but I honestly have no clue. Btw, this visual history is absolutely stunning and comes with two TFA concept art prints, one of which is Rey and Kylo fighting in the forest. @BastilaBey wrote: @frolickingfizzgig Right, I doubt there's anything intentionally misleading going on here, just something I noticed. It's been months since I read it, so can't remember if it's clear from the story how much time passes in Bloodline. If it's about a year, that would make more sense, but I honestly have no clue. If Bloodline takes place over the course of a year Pablo would actually be considered right. No mistake. He had yet to fall (as far as the audience was made privy to) by five years before TFA, one year after the beginning of Bloodline. That doesn't mean he didn't though. We don't know what happened in that year (or before it). Leia and Han had been out of contact with Luke and Ben for a while. I haven't heard of this one. Can it be picked up at say, Barnes and Noble? @frolickingfizzgig Yeah, it sounds like the 6 at the beginning, 5 by the end is probably right. It might just be an error in this book. Thank you so much, I know where I'm going tomorrow during my lunch hour!!! Bloodlines has made me very interested in finding out what really went down between Luke and Ben. What happened in the Skywalker/Solo family that caused Han and Leia to split (besides Ben turning into Kylo), How they knew that he was still alive and went to the first order and how Snoke played in their family drama. I have a feeling that he was a friend or associate of Leia and Luke. I am almost more excited to hear this part of the story than the Reylo stuff. Which, I know Rey plays a part in the dynamic that will hopefully make Kylo realize the mistakes he has made so he can become who he was supposed to be instead of some miserable, horrible villain. He is so bad at being a villain. Tom's a favourite of mine,I'd love to see him in a Star Wars film! I still can't believe that Greesolm didn't materialize! There was something, you could feel it, and than it was dropped. Even though it was repeated so many times that Seastriker was too young, so romance wasn't going in his. I'll ship Greesolm anyway and yes Tomyanka are gorgeous together. He's great as Loki in the Thor and Avengers movies. Actually he's the best thing in the Thor movies. My favourite part he had is in the vampire flick Only Lovers Left Alive. @motherofpearl1 wrote: He's great as Loki in the Thor and Avengers movies. I haven't seen the Jarmusch movie yet, but otherwise I'd say he's a good middleweight (if I can use a boxing metaphor) but definitely not a heavy weight. The whole thing about The Night Manager was how his character was in over his head, whereas Olivia Coleman's character (and just comparing the two actors), was more the Le Carre character, like Smiley. Far more impressed with her than him. Maybe other example I can think of is compare him with somebody like Idris Elba*, who Poe was supposedly written for. He can shift back and forth between light weight comedy, drama, and genre far more easily and with more skill than I've seen anything with Hiddleston (I may have Elba on the mind because I just saw the Guillermo del Toro exhibit in Los Angeles, where one of the sections shows his first appearance in the Jaegar suit and meeting Mako Mori as she's a child fleeing the scene of a disaster. * Just imagine the potential future scenario if it'd been Elba playing Poe. He's go all John Luther on the FO. I didn't know Idris was first choice for Poe! @motherofpearl1 wrote: I didn't know Idris was first choice for Poe! That's the rumor! I <3 Idris. Like I was in a yoga class a couple months where they played the Massive Attack song from Luther during one of the poses and I had a hard time not cracking up at the mental image of no-chill DCI John Luther teaching the class. If he had ended up as Poe, he'd have wiped up the floor with the FO. I hadn't heard that rumor, either! I've been a big fan of his ever since binge-watching The Wire 5 or 6 years ago, when that was the thing to do. I guess the takeaway from this is that they had always planned to cast a hot guy in the role of Poe? I could swear that the rumor was that both he and Michael Fassbender were courted for (and turned down) Poe. Either one would've been a force (har har) to be reckoned with as that character. I've seen Elba in the Wire and the US version of the Office, but it's really Luther (or if you use his accent Loofer) that I love the most. Elba as Poe would've quite easily wiped up the floor with the FO and made KR look like an actual emo teenager in comparison. He did do a Star Trek movie and is the hero of the Dark Tower adaption, so we'll have to content ourselves with that. I remember the Fassbender rumor, and I recall the Poe concept art with him as a black man, but I hadn't put 2-and-2 together that they'd targeted Elba for the Poe role. He's been doing voicework for Disney and Pixar lately, too! LOVE his voice. Uh, to keep on topic, Chuck Wendig has tipped his hat to saying that Claudia Grey is writing the best SW related novels currently out. Here's hoping she does the novel tie-in for VIII, especially having worked with RJ to ensure some of it is consistent with the story/script he wrote. I'm just getting around to reading the Chuck Wendig Aftermath series, although I've kept up with the spoilers, and I noticed something in the copy of the book I'm reading. On the back pages is a synopsis and brief extract from (the upcoming - as it is was then) Bloodline by Claudia Gray. I glanced over it and one thing leapt out at me, after all the discussions about Ben's surname and whether Leia used her married name, in this synopsis she's referred to as Senator Leia Organa Solo. 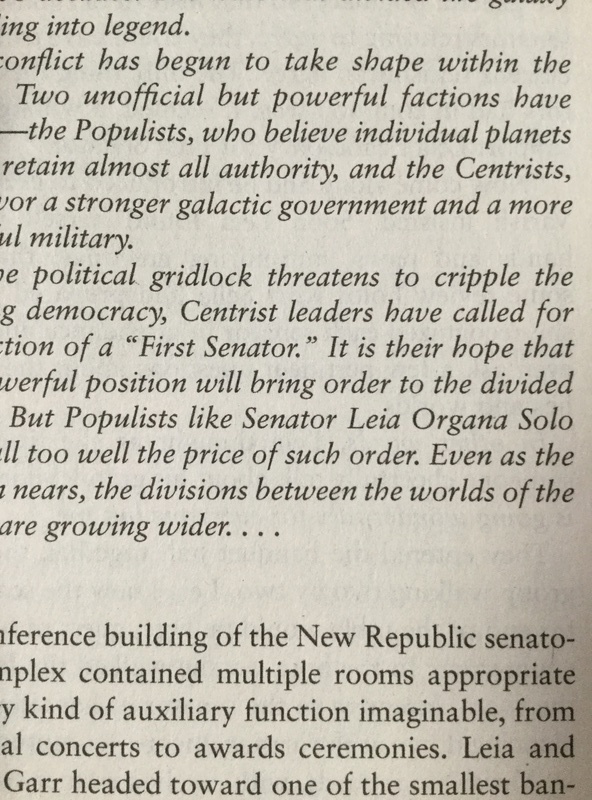 She doesn't appear under that title in my Kindle edition of Bloodline, only Senator Leia Organa. I wonder why they decided not to go with the double-barrelled name and if they were seriously considering Ben Organa Solo before choosing the more straightforward Ben Solo. This makes me wonder if Ben was more like his father than his mother or uncle. He apparently had no interest in things such as titles, and it did not seem to have been his choice to go and train with his uncle. Maybe he had wished all along to be an ordinary man just like his father (and Han expressed this wish as well in the novelization) but couldn't because Snoke was poisoning his mind and perhaps he was having trouble controlling his emotions and powers due to that. It might also account for how disappointed he feels in his father, if he'd wanted to learn racing as a possible career but Han was too busy or just never took the time to show him the ropes.